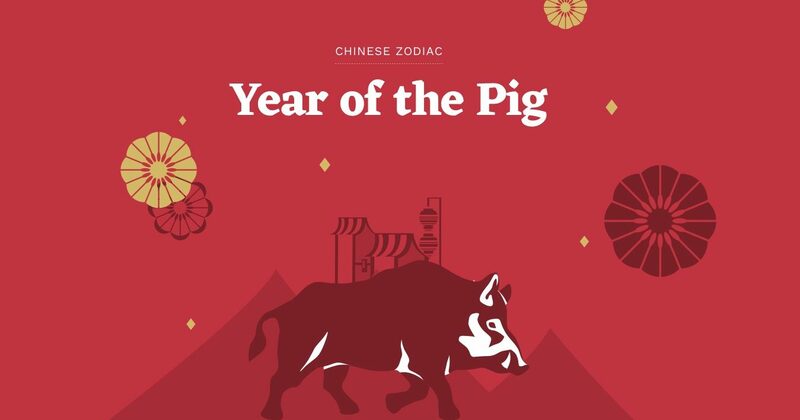 The lunar year of the Pig starts on 5th February 2019, one day after the solar new year. The Feng Shui year starts on the 4th February, on the solar new year. Chinese New Year celebrations start with Chinese New Year’s eve on the night before the new moon. 2019 is rather special because the Feng Shui New Year (solar new year) is very close to the celebratory Chinese Lunar New Year. Take care of the ‘Emperor’. You hear about the Emperor a lot from feng shui fans. The Emperor is referring to the number 5 star, a type of qi/energy with the personality of the Emperor. The Emperor can bestow favours on you when he is in a good mood and he can give you a lot of stress when he doesn’t look upon you favourably. To bring out the best in the so called Emperor Star, place some round or curved golden objects in the south-west area of your home or office. In feng shui speak this is adding metal element. The metal element can also be added in sound. Play beautiful piano music on your music streaming service and let the melody flow out of your bluetooth speaker. Place the speaker in the west area of your space so the tune travels to the south-west. Feng shui changes with time, so this tip applies from 4th February 2019 until 3rd February 2020. If you want to progress your career then let’s move to the east area of your house to boost your career star/qi according to feng shui principles. Again, the metal element is the winning formula here according to the annual stars theory. Have you ever won a trophy? If you have a curved shiny trophy place it in the east area. If your trophy sits on a black base that’s the perfect object for boosting the qi to support you in reaching your career goals in 2019. If you’re looking to attract new romance, how about placing a vase of fresh flowers in clean water in the north area of your home? Like the sound of that idea? Give it a go and let us know what happens. All the best for Chinese New Year 2019!